NEW DELHI: South Korean giant Samsung leads the pack when it comes to flagship Android smartphones, but Chinese smartphone players like OnePlus and Huawei’s e-brand Honor have until now ruled the popular Rs 30,000-Rs 40,000 segment in India. With an aim to make a dent in their market share, Samsung has introduced the Galaxy A8+ for Rs 32,990 for 6GB RAM and 64GB on-board storage, which will compete with OnePlus 5T and Honor View 10. Is it time for Samsung’s rivals to pull up their socks? Let us find out. Take a glance at Galaxy A8+ and you’re sure to mistake it for the pricier flagship Galaxy Note 8. Well, at least from a distance. Having said that, the device has lost the curved edges on the display and, at 8.3-mm, it is less thicker than the Note 8. The smartphone makes use of shiny glass and metal for an ergonomic body. Without any creeks, the design is sturdy and has a premium feel to it. It is not a slim device. However, the curved edges on the rear fit nicely in the palm. Unlike the previous A-series devices, Samsung has increased the screen-to-body ratio by removing the home button and physical navigation keys. The fingerprint sensor has been moved to the rear but unlike Note 8 and Galaxy S8, it sits below the camera sensor. The camera lens and scanner combine to make for an interesting soda can pull tab-like design. We found the fingerprint sensor snappy, but the unlock animation was a bit slow. The device sports a six-inch Full-HD Super AMOLED Infinity Display with 18.5:9 display ratio and skinny bezels which is great for immersive experience while watching videos or long gaming hours. The display was bright with punchy colours and, as always, AMOLED made blacks look deep with great contrast. Viewing text and images under direct sunlight was a delight. Samsung joins the bandwagon of selfie-centric smartphones with the device that sports a 16MP+8MP dual-front camera with f/1.9 aperture and returned high-quality photos. Selfies were rich in detail and colours and the dual lenses made for great selfie shots with “bokeh” effect. The 16MP primary camera with f/1.7 aperture and flash captured clear and vivid pictures in well-lit as well as the low-light conditions. The lack of a secondary sensor on the rear was not much of a put-off as the camera blurred the background of the subject while shooting macros. The camera app also includes “Bixby” vision that works like Google Lens and identifies objects once the lens is pointed at them. The IP68 certification for water and dust resistance is worth mentioning here, which neither Honor View 10 nor OnePlus 5T offer. Bucking the trend, the smartphone retains the 3.5-mm headphone jack that is housed alongside a USB Type-C port at the base. Unlike Note 8 or S8 and S8+, the device does not house a bottom-firing speaker. It is loud and now sits on the right, making it a distinct design element. Performance of the device was smooth, thanks to 6GB RAM and the company’s homegrown mid-range “Exynos 7885” octa-core chipset. A generous 3,500mAh battery with fast-charging technology powers the smartphone which seemed to last longer than Honor View 10 that has a slightly bigger 3,750mAh battery. We got more than a day’s life on moderate-to-heavy usage that included streaming videos on YouTube, running social media apps or playing games. OnePlus 5T, on the other hand, houses only a 3,300mAh battery but its proprietary “Dash Charge” for quick charging was definitely faster. The smartphone features Android 7.1.1 Nougat OS with Samsung’s custom skin “TouchWiz” on top. The fans of stock Android may not like the experience. However, it is worth mentioning that the company has now revamped its “TouchWiz” with minimal bloatware. Galaxy A8+ houses Samsung’s own Artificial Intelligence (AI)-based digital assistant Bixby. But for some reason, it is a toned-down version on Galaxy A8+. Unlike Note 8, there is no dedicated Bixby button and no support for voice functionality and, thereby, no “Hi Bixby” as well. 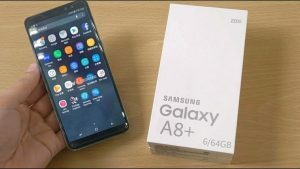 Conclusion: Galaxy A8+ from Samsung gives some serious competition to Chinese rivals in terms of great build, performance and value for money. We would recommend the smartphone to those who do not want to spend hefty money on a flagship and yet want to own a premium-looking device.